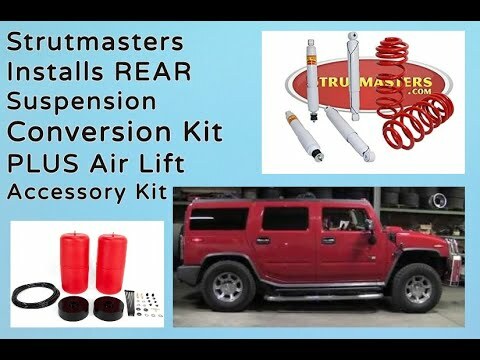 Strutmasters 2003-2009 Hummer H2 Air To Coil Spring Conversion Kit With Rear Shocks is the perfect solution to your air suspension problems. Designed to be very affordable, you can convert your ENTIRE air suspension system to use passive shocks and coil springs for less than the price of replacing just ONE Original Equipment air spring. 2003-2009 Hummer H2 Rear Air Suspension Conversion Kit With Rear Shocks (2WD & 4WD) (HA1RB) is the perfect solution to your air suspension problems. Designed to be very affordable, you can convert your air suspension to use standard. 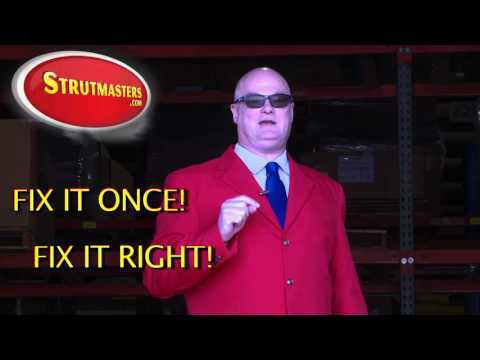 Since 1999, Strutmasters has been helping customers fix their suspension problems at a huge savings over Original Equipment repairs. We are called the Suspension Experts because we invented the first fully-assembled suspension conversion kit almost twenty years ago and fixing suspensions is ALL we do. Our conversion kits are specifically designed to fit your vehicle and all of them are assembled, sold, shipped and serviced by our team right here in North Carolina. We use high quality components, assembled in small batches to ensure you get a great ride every time. We're the only company to feature Eibach coil springs, made in California. Unlike cheaper springs made in China, our Eibach springs are made with cold wound steel -- which ensures the springs will keep their strength over time. Your conversion kit comes with two premium rear shock absorbers, two Eibach coil springs and detailed instructions to make installation easy. Our kits are a direct replacement for your air suspension and can be installed in about an hour per wheel. If you have any questions during the process our tech support team is available to answer all your questions. Don't be bothered with ongoing air suspension repairs, convert your Hummer's suspension to a passive coil spring suspension and save yourself time and a ton of money. Just like most other vehicles with an air suspension, the most obvious sign of trouble for your 2003-2009 Hummer H2 is a loss of three to five inches of ride height in the rear of the vehicle. On models with air suspension, rubber air springs at the rear two wheels fill with pressurized air to hold up that part of the vehicle. Millions of up and down motions and dry rot from age cause tiny cracks to form in the rubber portion of the air springs. The rubber air springs begin to leak air from the system and as the leaks worsen, they eventually cause the onboard air compressor to get overworked. The air compressor will overheat and shut off. At times, the compressor may turn back on and run, but it can no longer make enough air to support the vehicle. Experienced technicians tell us that replacement of all the major components in the air system is the best hope of a successful repair. A complete overhaul can cost thousands of dollars, which is why the Strutmasters conversion kit is such a popular alternative. = Over $2,600 (but that doesn't include replacing electronic components that are known to fail such as the height sensors). + Air Springs ($215/pair) + Rear Shocks ($40/shock) + Compressor Assembly ($1,500) + Dryer ($100) = Over $1,800 (but that doesn‚Äôt include replacing electronic components that are known to fail such as the height sensors). 2003-2009 Hummer H2 Rubber Air Springs (x2) - Commonly referred to as air bags, a plastic and rubber bag that uses pressurized air as a cushion to support the weight of the rear of the vehicle. Tiny cracks in the rubber air springs, due to age and wear and tear, are the number one cause of all air suspension leaks. Since all air springs go bad at about the same rate, if one is leaking, the others will not be far behind. For a proper repair, all of them need to be replaced at the same time. 2003-2009 Hummer H2 Shock Absorbers (x2) - Metal tubing filled with gas-charged hydraulic fluid that controls bouncing motions and dampens vibrations caused by travel on rough road surfaces. 2003-2009 Hummer H2 Height Sensors (x2) - A linkage located near each wheel of a vehicle that measures the height of the vehicle and reports this information back to the control module. The ride height sensor is a moving part, and like all moving parts, they will eventually wear out. 2003-2009 Hummer H2 Air Lines- Tubes that carry pressurized air to the air springs in order to adjust the height of the vehicle. 2003-2009 Hummer H2 Solenoids (x2) - These plastic and metal components regulate the air pressure for each air spring. Solenoids start to leak as they wear out causing the compressor to be overworked and/or fail. 2003-2009 Hummer H2 Air Compressor Assembly- Creates and sends pressurized air to the air springs. When the air suspension starts system starts leaking, the compressor (also known as an air pump) starts working harder to try to keep the system inflated. By the time air suspension leaks down completely, the compressor will be severely damaged or completely failed. Buying replacement air springs and taking the time to install them, only to find out the compressor still needs to be replaced, can be very frustrating and expensive. Even after installing a conversion kit, if the compressor still has life, vehicle owners will still be able to use it's external nozzle to inflate tires and other items. 2003-2009 Hummer H2 Dryer- prevents moisture build-up inside of air suspension parts. 2003-2009 Hummer H2 Suspension Control Module- a computer which is responsible for the operations of the air suspension system and maintaining the vehicle's correct ride height. 2003-2009 Hummer H2 O-rings- Although they are the least expensive parts of the air suspension, they are responsible for maintaining the seal where all of the air lines connect. Be sure to replace the O-rings when repairing any air suspension system. My H2 suffered from a saggy rear end. Here’s how Strutmasters took my truck’s rear suspension from zero to hero. * Phone reps know their products, answered all my questions. * Installation to convert from the stock H2 air ride to the Strutmasters coil was very straight-forward and was done in my dad’s (home) garage with a jack and some basic tools. * Direct replacement parts is nearly the best way I could describe this kit. Knuckles weren’t busted, torches weren’t turned on, etc. * Truck sits perfectly level with the kit and ride feels the same without the headache of a future sag issues. Feel a big weight lifted never having to worry about it again. About 5 years ago, my air bags went bad and replaced them. I was good up until about a month ago when the compressor failed. After dealing and fighting with the air ride now twice at this point, I had enough and started looking into a coil conversion because I never wanted to deal with the sag issue again. I called Strutmasters and the representative that answered the phone had all the answers to my questions, ordered the HA1RB kit over the phone (my shocks were in questionable shape so ordered the kit that came with shocks while I’d be in that area) and in a few days the parts all arrived. I was expecting this to be a bit of a project, but the the parts were almost literally direct replacements. Directions were to the point and pretty obvious. The truck sits perfectly level and the ride feels the same, without the headache of ever having to worry about the air ride or rear sag ever again! Anybody that’s tired of dealing with the air ride issues, absolutely check out the Strutmasters kits and save yourself the headache. Strutmaster’s kits are going the be the first thing I mention to any other H2s I see with dragging rears. Feel much more confident in the truck’s reliability! I contacted the dealer about changing my air suspension in my Hummer H2 to spring and they were charging me nearly $1700.00 for the entire job! Strutmasters sold me an excellent kit after giving me great advice AND recommend a local garage that installed the springs and shocks. Total cost: $750.00! Saved nearly a grand! They are simply the BEST at what they do. I was a wreck when I first started. I was worried that my H2 was going to tip or something major was going to happen. I contacted strutmasters a couple days before the install for a walk through. He recommended spraying the parts down with PB Blaster. That worked like a charm! After getting the first side in, in the rear, my confidence grew. Impact wrench, breaker bar or torque wrench are a must. Love the product, and no more service air suspension light. The ride height looks a whole lot better!